"The scheme will allow depositors of gold to earn interest in their metal accounts and jewellers to obtain loans in their metal accounts. Banks and other dealers will also be able to monetise gold," FM had said. The government is planning a scheme under which you will be able to monetise gold and earn interest on it. "The scheme will allow depositors of gold to earn interest in their metal accounts and jewellers to obtain loans in their metal accounts. Banks and other dealers will also be able to monetise gold," Finance Minister Arun Jaitley said while announcing the gold monetisation scheme in his Budget speech. Though the details are not yet out, the scheme will most likely treat gold deposits like fixed deposits. The interest earned will be paid in gold. Customers will be able to open add-on metal accounts with their banks. The gold could be deposited for a fixed period, with a rollover facility similar to what is offered in rupee fixed deposits. The interest rate will depend on market conditions. Banks will probably be able to lend this gold to jewellers or deposit it with the Reserve Bank of India. Rajesh Khosla, managing director, MMTC-PAMP India, explains. "To avail of the scheme, customers with bank accounts will have to apply for add-on accounts, which will be in gram(s) of gold. Whether coin, bar or jewellery, all gold brought to the purity verification centre will be melted to determine its purity." MMTC-PAMP is one of the world's most advanced gold and silver refining and minting facilities. It is a joint venture between India's MMTC and Switzerland's PAMP SA, a part of the MKS group. After melting, the gold will be credited to the customer's metal account. A bank-designated refiner will then convert it into a bar for further use by the bank. Khosla says, "It will give investors (even those who have less gold) an opportunity to earn interest on the metal. The gold can be deposited for a fixed tenure. The rate of interest is expected to be 2-3% depending upon how the scheme is structured." But how is this scheme different from the gold deposit scheme (GDS)? The GDS was formulated in 1999 to mobilise the country's idle gold for productive use. Under it, the minimum gold required is at least 500 gram. In gold monetisation scheme, investors will be able to deposit gold in much smaller quantities. Jaitley also proposed the development of Sovereign Gold Bond as an alternative to physical gold. The bond will carry a fixed rate of interest and be redeemable in cash (face value of the gold). The bond will be pegged to the prevalent gold price. It will also pay a fixed interest and thus become more attractive than physical gold. So, the investor will benefit from price appreciation and also earn interest. "These are being launched to reduce gold consumption. At the same time they will give people an avenue to invest in gold without holding it physically. We believe these bonds may offer an interest rate of 5-6% to entice investors. I don't think these bonds will involve holding of physical gold. I think they will be made tax-free to attract investors," says Chirag Mehta, fund manager, commodities, Quantum AMC. Vikaas Sachdeva, chief executive officer, Edelweiss Asset Management, explains the difference between sovereign gold bonds and gold exchange-traded funds or ETFs. "While both instruments-sovereign gold bonds and gold ETFs-are designed to track gold prices, they are different in the sense that gold bonds pay additional interest over the term of the investment. ETFs also charge a fee from investors." "Prices of gold will not be affected till the policy is out," says Jayant Manglik, president, retail distribution, Religare Securities. Jaitley also suggested the development of an Indian gold coin carrying Ashok Chakra. The aim is to reduce demand for coins minted outside India and recycle gold available in the country. The government may use the monetised gold to mint the proposed coins. We believe these bonds may offer an interest rate of 5-6% to entice investors. I do not think these will involve holding of gold. Vimal Patel, chairman and managing director, Suwarnsparsh, says, "Apart from discouraging import of gold coins and promoting 'Make in India', minting of gold coins will be possible with the amount of yellow metal deployed by depositors in lieu of sovereign gold bonds. This will control the current account deficit." India is one of the largest consumers of gold in the world. 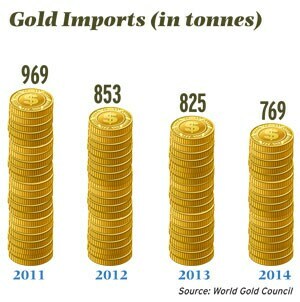 It imports 800-1,000 tonnes gold in a year. These imports have in the past resulted in the problem of current account deficit, leading to weakening of the Indian currency. Aviral Gupta, independent investment strategist, says, "Conservative estimates show that if only 30% gold held by households is monetised, its value may be as much as $5 billion. It will be a game changer as it will incentivise banks to hold gold in deposits as part of the mandatory cash reserve ratio or the statutory reserve ratio, freeing up resources for productive purposes."